2 or more: $284.99 ea. Coated inside and out with an Autograph nonstick coating, Anolon Advanced cookware provides heavyweight, professional-quality performance and 21st-century convenience. Pots and pans clean easily, while the rugged nonstick readily releases food. Beneath the nonstick is heavy-gauge, harder-than-steel anodized aluminum. Pot and pan bottoms are left uncoated to conduct heat quickly and prevent hot spots. Like many other Anolon cookware lines, Anolon Advanced features the company's patented SureGrip handles, which are a combination of 18/10 stainless steel and silicone rubber and are riveted to the sides for durability. The ergonomic handles provide a comfortable, confident grip and stay cool on the stovetop for easy control. 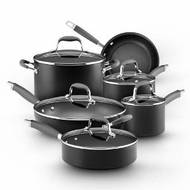 Break-resistant, domed glass lids permit cooking to be monitored without releasing heat and are oven-safe to 400 degrees F. This 11-piece set outfits a kitchen with all essential pots and pans. It consists of an 3 quart covered saute pan, a 1-1/2- and 3-quart covered saucepan, an 8-quart covered stockpot, a 12-inch covered deep skillet and an 8-1/2-inch open French skillet. The cookware carries a limited lifetime warranty against defects and should be hand washed.